Author: Lynskey, Ed Set In . . . Description: Pelham Fell Here offers readers Frank Johnson's rich back story, an unusual departure from most of today's private eye series. We learn how the ex-military cop and part-time gunsmith Frank, now back living in his hometown of Pelham, Virginia, gets into the private investigator racket. He discovers somebody has killed his cousin Cody Chapman with a twelve-gauge shotgun blast. Enraged, Frank wants some answers and wants them fast. Was Cody involved in an illegal arms smuggling scheme? The disturbing mystery grows deeper when a pair of murderous deputy sheriffs ambush Frank on the river. After killing them in self-defense, Frank must take it on the lam while he continues his investigation, relying on his wits and smarts. Eventually, he finds a vicious group of Neo-Nazis holed up in a remote mountain castle may be behind Cody's murder. Frank realizes he's outnumbered and outgunned, but it hardly deters him from seeing the fight through to the end. Luckily, a couple of bounty hunter pals, Gerald and his kid brother Chet Peyton, throw in with Frank to even the odds. Events heat up to a frenetic pace until the climatic moment when Frank finds himself entangled in a dogfight for his very life. In The Dirt-Brown Derby, P.I. Frank Johnson is hired by Mary Taliaferro, a wealthy aristocrat owning a horse estate near Middleburg, Virginia. Mary's teen-age daughter Emily has died in a riding tragedy. The local law enforcement says it's an accident. Mary thinks it's murder. 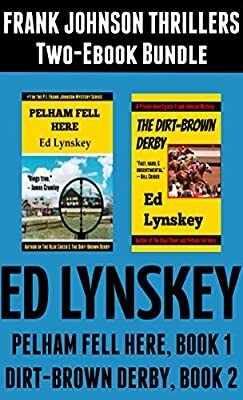 Frank is broke and the money Mary offers is too good to pass up, but his case quickly becomes more complicated when the stable manager is murdered one day after Frank begins his investigation. Frank soon discovers that there is much more going on here, and he is determined to get to the truth, even if it kills him.